Description: Reveal a style of glam and flair embellished upon Hollywood theaters. 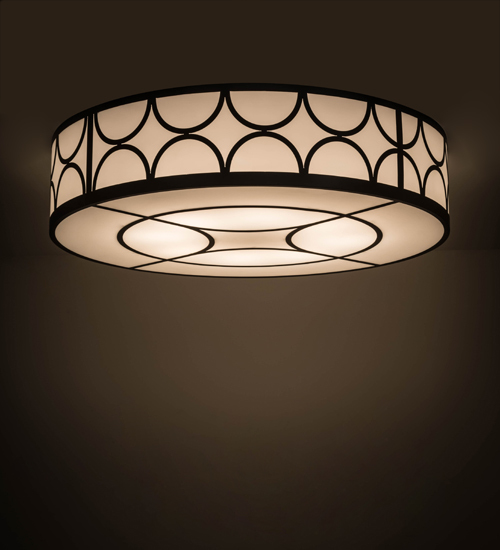 This fanciful ceiling fixture features a dramatic Retro design with stylized stars and curved lines highlighted around the perimeter and on the bottom diffuser. The decorative accents, frame and hardware are featured in a Timeless Bronze finish which complements Statuario Idalight. This fixture is handcrafted by highly skilled artisans in our 180,000 square foot manufacturing facility in Yorkville, New York. Custom sizes, styles and finishes, as well as dimmable energy efficient lamping options such as LED, are available. UL and cUL listed for damp and dry locations.